The older one gets, the more nostalgic they become. I look back with a more appreciable perspective. My photographs shot years ago have a deeper meaning than when I first took them. Maybe that’s because the moments are gone and can never happen again. They become a window into the past. Lately I’ve studied old photographs more than I’ve shot new ones. Some are technically flawed, but that doesn’t diminish the value much. I was young and learning the ropes of photography. Images and equipment improved over time, and subjects evolved. When I moved here 45 years ago, I was the only photographer in town. That had results that I didn’t anticipate. Consequently, I shot nearly two hundred weddings, portrait sessions and other events. Yearning to be out in nature, it was work that I was never truly comfortable with. 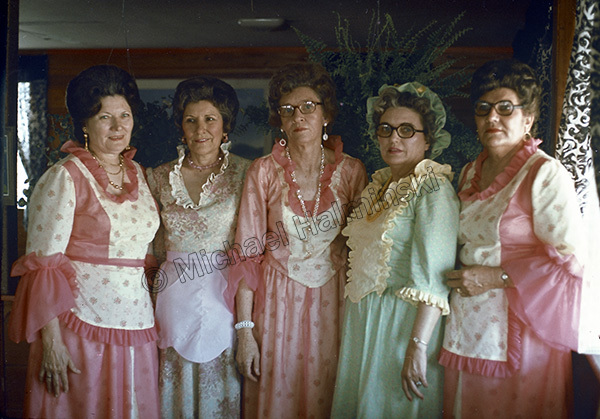 In 1975 I was asked to take a picture of local women who worked at the restaurant at the Rodanthe Pier. It was the beginning of the tourist season and they were outfitted in their very best homemade dresses. As I recall, they are from left to right: Laura Scarborough, Thelma Midgett, Mellie Edwards, Wilma O’Neal and Elizabeth Gray. They all wanted to have me make prints for them. Midgett Day was a local event begun in 1972 to celebrate the heroism and lifesaving of the Midgett family, so renown in the annals of Coast Guard history. 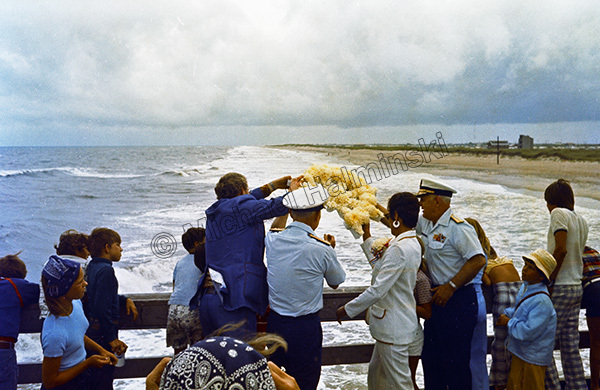 It was culminated with a memorial wreath thrown into the sea from Rodanthe Pier. The man in the blue jacket is Don Edwards, and the woman in white Maggie Smith, both members of the Midgett family. This was taken July 1978, and I think it was the final celebration of Midgett Day. Don Edwards incidentally, was the one arranging most of my wedding and social jobs. The striking aspect of this photograph is the lack of oceanfront development south of the pier. 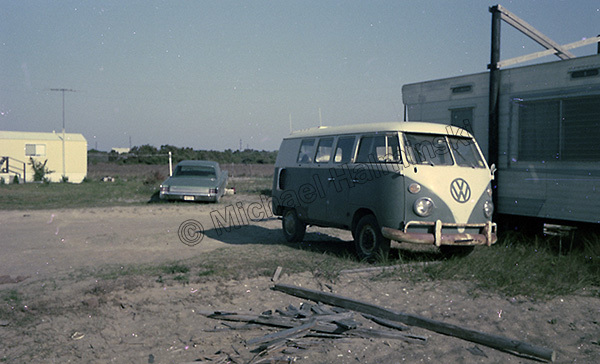 The vehicle that brought me here was a 1964 VW Microbus. I paid $900 for it in 1968, and it took me on a number of trips, including several to the Outer Banks. I outfitted it to modestly accommodate one or two people on overnight sojourns. It was in constant need of maintenance and tune-ups. Whenever it broke down, I knew how to fix it, including rebuilding the engine 3 times. It originally had a 1500 cc engine and ended up with a peppier 1600 “pancake engine”. With the tires deflated to 15 pounds, I could go anywhere on the beach. I drove it 15 years until the corrosive salt air took its toll. Mac Midgett hauled it away to his junk yard and I replaced it with a Datsun pick-up truck that also rusted away to the same junk yard. This entry was posted in automobiles, history, Outer Banks, People on April 15, 2018 by j0jgvm89bj.